Brown-headed cowbirds are brood parasites – a term which is pretty much as terrible as it sounds. Basically, these cowbirds mate, and then never build a nest. The females quietly figure out which birds are building nests and then deposit eggs in the nests of these unsuspecting birds. Some birds can figure it out and certain species of warbler will build anther nest over the cowbird egg and lay their own eggs again. Some birds either can’t figure it out or aren’t able to find a way to dispose of the cowbird eggs. Given that cowbird eggs hatch and grow more quickly than the chicks from the host birds, it’s a pretty grim scenario for the hapless chicks whose parents are exhausting themselves feeding the invading and aggressive cowbird chick. 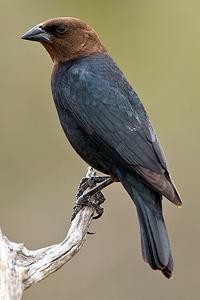 But during its young lifetime from egg through fledging, all the cowbird chick knows is the host species – most of whom are smaller and don’t look very much like a cowbird. But at the end of the summer, suddenly there are huge flocks of cowbirds – adults and juveniles – which congregate before migrating south. So, the mystery is…just how do these young cowbirds figure out they aren’t warblers or sparrows or whatever else they have grown up around, but are cowbirds? Turns out that young cowbirds do a variety of things but the most interesting one is that they are able to inspect themselves and determine what they look like, then search out other birds that look like them. Yep, that’s right! And all without a mirror or any training. For more detailed info on this, check out the article in American Scientist. You may never look at a Brown-headed cowbird in quite the same way again.